Zania is wearing Swarvoski Crystal Flatback Rhinestones in Light Rose, Clear Crystal and Resin Crystal Tip: Go slow and be sure to let your crystals get tacky between placements so they don't start shifting out of place. 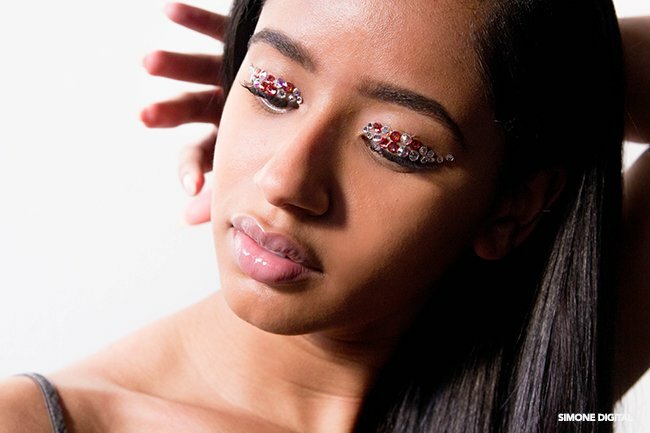 Zania is wearing Swarvoski Crystal Flatback Rhinestones in Light Rose, Clear Crystal and Resin Crystal Tip: Use clear glue like Callas Eyelash Adhesive. Zania is wearing Swarvoski Crystal Flatback Rhinestones in Light Rose, Clear Crystal and Resin Crystal Tip: Keep it simple! 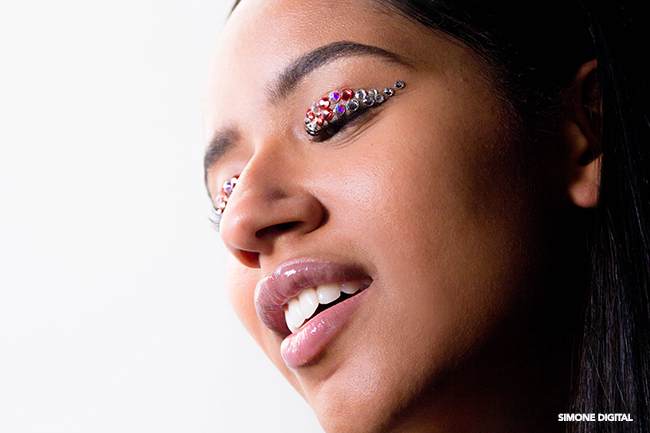 Place the crystals on your lids and outer corners for a stunning look. 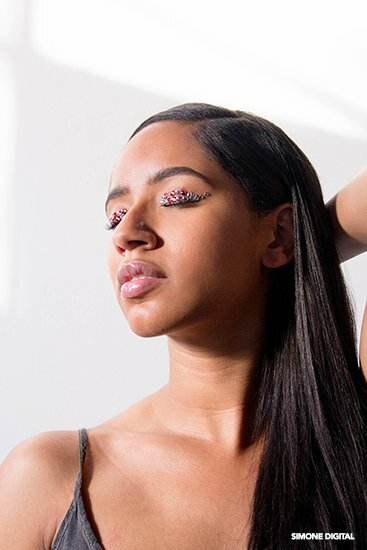 Zania is wearing Swarvoski Crystal Flatback Rhinestones in Light Rose, Clear Crystal and Resin Crystal Tip: Be sure to use dull, rounded tip tweezers so that you don't risk damaging your eyes. Zania is wearing Swarvoski Crystal Flatback Rhinestones in Light Rose, Clear Crystal and Resin Crystal Tip: If you want identical patterns, apply one crystal to each lid at a time. Imagine you’re at “the” New Year’s eve party right now at some wonderful penthouse, restaurant or just a cool house party thrown by an even cooler person. You’re having a wonderful time. The drinks are flowing, the countdown clocks are running and there is no other place that you would rather be than where you are right now. And then it happens. As a new set of guests arrive to boogie in the new year, there she is: the woman who has your exact makeup look; the glittery eye look that took you a whole hour to do. The look that you just knew would make you stand out. Quelle horreur! Her makeup is identical down to how you cut your crease and it’s clear that you were both watching the exact same YouTube tutorial. This is the stuff of beauty nightmares. 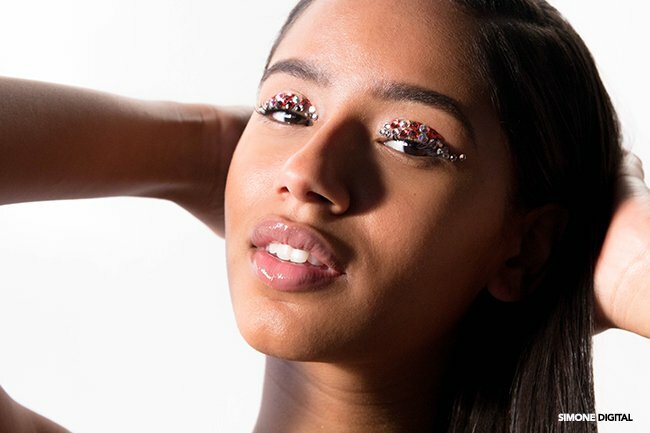 Okay, this story is obviously a bit of an exaggeration but we’d still like to suggest that if you were planning a glittery look to ring in the new year you think of going a bit…bolder with your “glitter” eyes because no wants a New Year’s doppelgänger. It’s clearly official that in addition to metallics, glitter and sparkle is becoming all the rage on everything from shoes to eyes. 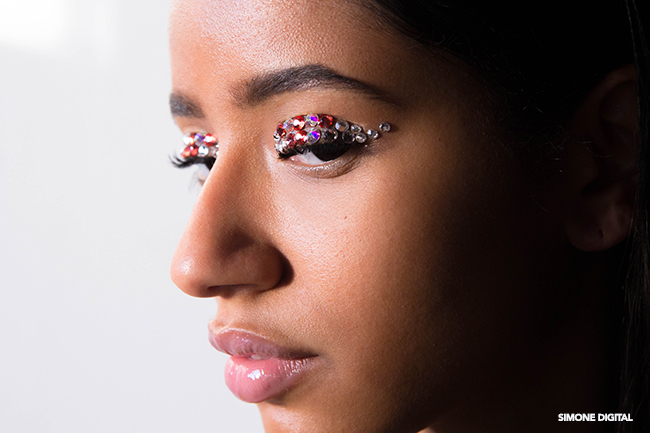 For those of us who love glitter, shimmer and sparkle but find it hard to incorporate into our makeup looks this is the season for you. 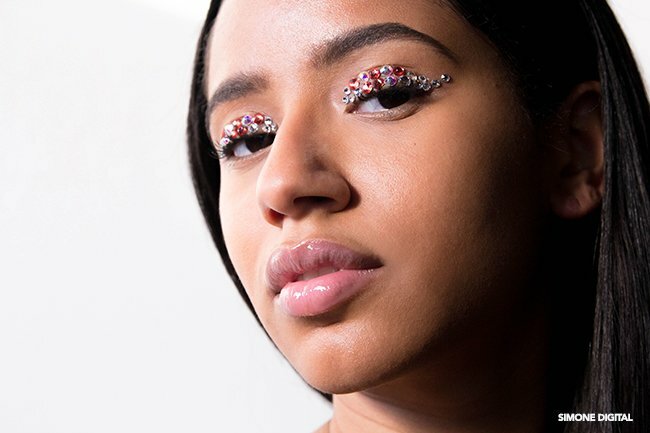 With a new year right around the corner, and lingering holiday parties still in full effect, nothing screams I’m ready to party like a pair of Swarvoski Crystal Flatback Rhinestones donned eyes. Zania is wearing Swarvoski Crystal Flatback Rhinestones in Light Rose, Clear Crystal and Resin Crystal. 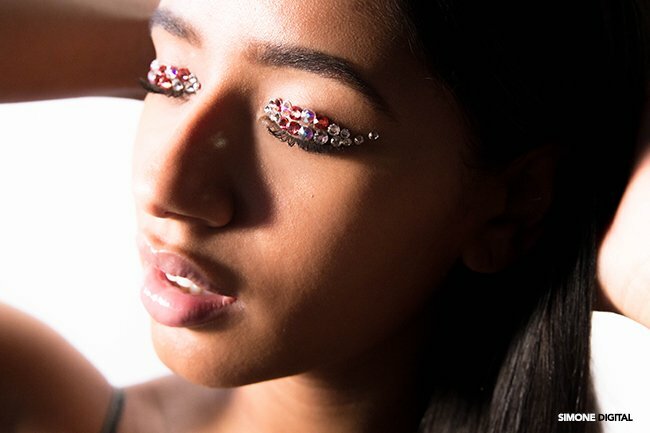 Tip: You an use any flat back crystals that you’d like for this look, however, Swarovski flat backs are more than affordable and provide much more sparkle that most brands. 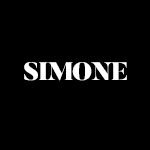 We like this looked paired with clean skin finished in either a light tinted moisturizer or sheer foundation, natural brows and neutral lips. Most people would think to play this up with heavier makeup, and though that does work, these eyes speak for themselves and need no competition. Zania is wearing Swarvoski Crystal Flatback Rhinestones in Light Rose, Clear Crystal and Resin Crystal. 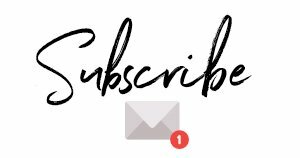 Tip: If you like this look but want something much simpler, apply a crystal or two your outer corners or add one to the middle of your lower lashes similar to this look. To get Zania’s look for yourself, all you need is some lash glue (one of the best glues for this task is Callas Eyelash Adhesive, a latex-free eyelash glue), dull-tipped tweezers and an assorted set of small to medium Swarvoski Crystal Flatback Rhinestones in any color combination that you wish (we found that no more than three colors always work like a charm). You can pick up the crystals at most craft stores. To make sure your gems last all night, be sure to clean your lids with a quick swipe of astringent or toner to clear your skin of any oil. From there, just use your imagination for how you want to place your crystals.